One of my first loves as an alpine gardener was the Genus Narcissus, and despite diversions I must admit I have returned to them ever since. In the long winters there is no more exhilarating feeling than going to the greenhouse (after the work has been done re-potting in the autumn), to see which one will be flowering next. With a little thought this will take me from October through to spring, with the main period in March. There is only one drawback to all this, and it does not affect the plants themselves or the appreciation of them. It is hard to put a correct name to some of them. The only readily available reference is “Narcissus - A Guide to Wild Daffodils” by John Blanchard – who gave a talk to the Ulster Group a few years ago. There is also a lot of information spread out over various journals. Narcissus cordubensis is such a plant. 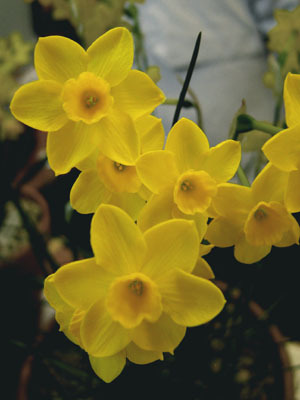 It is easy to put it into the section Jonquillae of the Genus Narcissus. It is spring flowering (with me in March); the corona is markedly shorter than the petals; the stigma and anthers are included in the corona; and crucially the leaves are green without a keel which separates it from similar plants in the Section Apodanthae which have glaucous keeled leaves. Getting past this to a “correct” name is the difficult bit. John Blanchard comments that Jonquils are bewilderingly variable plants in the wild, and refuse to fit neatly into any system of classification. I imagine when he wrote the book that he was metaphorically (if not physically) throwing his hands up in the air at the thought of another species that had been described solely on measurements. He knew better, as he had spent years studying and measuring populations in the wild. The Genus Narcissus is obviously still evolving as (unlike the Genus Cyclamen) hybrids between species –either in the wild, or artificially produced -are not at all uncommon. I obtained three bulbs from Buried Treasure (Bob and Rannveig Wallis) in August 2000, at the reasonable price of £1.50 each – bulbs like to be together. It has increased steadily since with an annual re-pot, and the pot now has 18 flowering scapes up to 25cm with from one to three flowers on each. The flowers vary a little bit and are generally 30mm across. It has a rather untidy habit, as smaller bulbs with only one flower are much shorter. This is more than made up for by the vigorous nature and flowering potential of the plant. I have not tried it outside but John Blanchard comments that it is easy (if only all plants were) in a pot and also in the garden. It is also sweetly scented. What more should we ask!! Plants located by Commander Chris Stocken in the Sierra de Ronda in southern Spain were provisionally identified by him as Narcissus jonquilla var henriquesii and distributed commercially as such. They were later raised to species level by Fernandez Casas as Narcissus cordubensis (the latter part of the name presumably referring to Cordoba). This has not been accepted by the Flora of Western Andalucia where it is considered a subspecies of Narcissus fernandesii, but Blanchard considers it distinct enough. If you want to see it in the wild – a pleasure I have still to look forward to - it grows in wet turf near Ubrique and in ploughed fields and ditches near Ronda (an indication that you cannot give it enough water whilst in growth). 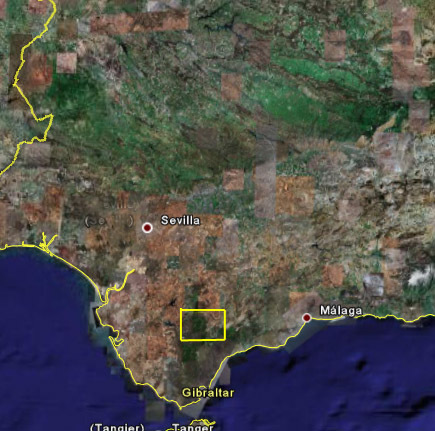 Casas also locates it in the Sierra de Cabra in the Province of Cordoba. I have found two fairly recent references in The Alpine Gardener (formerly The Bulletin of the Alpine Garden Society) – a priceless source of information. In a special bulb issue in September 1998 John Blanchard revisited Ronda and found it at south of Grazalema and at Ubrique. The accompanying photograph looks a shade or so too dark but captures the essence of the flower. In the December 2001 issue Phil and Gwen Phillips wrote up a photographic trip in search of early flowering wild daffodils in Spain and Portugal. After some initial disappointment with plants having vanished at two sites they had been given due to road improvements, they found it in a wet drainage seep at the edge of a ploughed field between Grazalema and Ronda (the photograph captures the colour far more accurately). 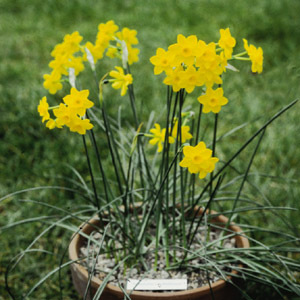 I also obtained two bulbs of the Lemon Form of Narcissus cordubensis from Bob at the same time as my original plant. They were only slightly dearer at £2.50 each. After initially doing well with pot culture (from memory they were a neater version), they succumbed to basal rot. I thought I had lost them altogether, but in going into the greenhouse today I discovered a pot with six bulbils that had survived. There is hope for me yet.